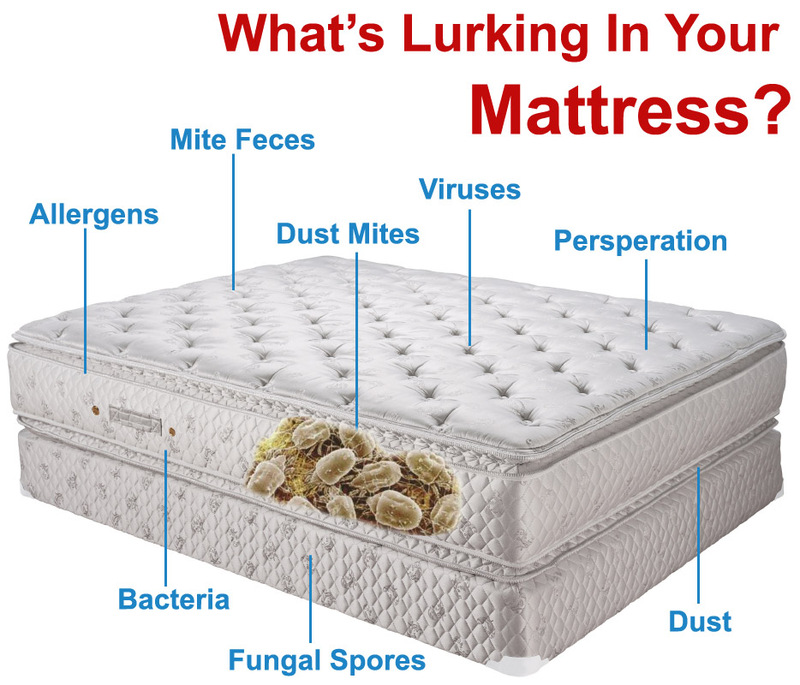 Mattress Cleaning – What’s Lurking in Your Mattress? Are You Sleeping With the Enemy! We spend nearly 1/3 of our life in bed; unfortunately the warm humid environment combined with dead skin, oils, and bodily fluids create a breeding ground for dust mites and bacteria, making our mattresses one of the most unhygienic places in the house! Each mattress can contain nearly two million live dust mites and their excrement! These unsanitary conditions that you sleep on each night can trigger allergic reactions and aggravate asthma, eczema and other allergies, even for those without existing allergies. Continued exposure to these allergens can lead to more serious illnesses later in life. To reduce the level of unhealthy contaminants and provide a healthy sleeping environment, mattresses should be cleaned at least once per year and in some cases more frequently. Our Unique Process Has Given Relief to Allergy Sufferers In Virginia! Our unique cleaning process treats the source of the problem by removing much of the allergens. By cleaning with a high temperature specialized cleaning solution and thoroughly rinsing and extracting we greatly reduce the amount of allergy causing contaminates. Reduce Pet and Dust Mite Allergens by 90% or more! Following the deep cleaning our allergy relief treatment is applied to the surface of carpets, mattresses, and furnishings. Proven effective, this powerful and safe anti-allergen works by denaturing the allergen proteins from dust mite droppings, pet dander, and cat saliva. Our Allergy Relief treatment actually changes the shape of the proteins to reduce their ability to bind to our anti-bodies, keeping them from being “recognized” by our immune system and alleviating the allergic response. Safe & Healthy For the Entire Family! Our Allergy Relief Treatment is non-toxic, dye and perfume free, contains no volatile organic compounds (VOC’s), phosphates or other hazardous materials and is biodegradable and environmentally safe. Regular cleaning and treating of carpets, upholstery, and mattresses has given relief to allergy sufferers. Cleaning of these surfaces should be followed with our Allergy Relief Treatment to control allergens between regular cleaning. Call Today and you could be feeling relief from allergies as soon as 2-3 days.